The Atomic Developer Bundle (ADB) is a prepackaged development environment filled with production-grade, pre-configured tools, that makes container developers’ lives easier. The ADB supports the development of multi-container applications against different technologies and orchestrators while providing a path that promotes best practices. It provides a container development ecosystem that ensures developers are able to work with Linux containers even if their base operating system does not support it. It also offers a quick and easy way to setup multi-container applications that take advantage of management and/or orchestration solutions, such as OpenShift or Kubernetes. The ADB supports Nulecule and Atomic App. These projects provide a structure for packaging, distributing, and deploying multi-container applications. In this article we are going to show you the detailed installation instructions of ADB CentOS 7 server using VirtualBox and Vagrant installation setup. There are two different virtualization providers supported on Linux, that is VirtualBox and libvirt. Both will work equally well in their default configuration. Let’s see how are going to setup VirtualBox on CentOS 7 using simple below commands. Open your command line terminal and switch user to root then run below commands to install latest EPEL release and ‘dkms’ package as shown below. 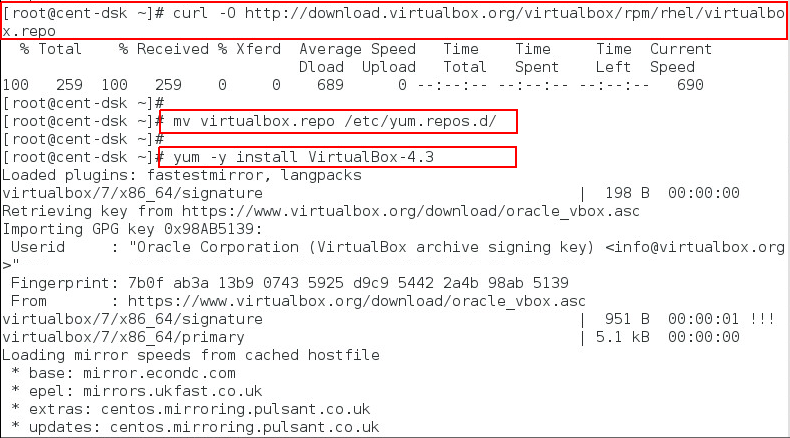 Now run the following commands to download and install Virtual Box repository after moving to ‘yum.reps.d’ directory as shown. Once the installation are complete, then run the command below to initialize Virtualbox kernel module. 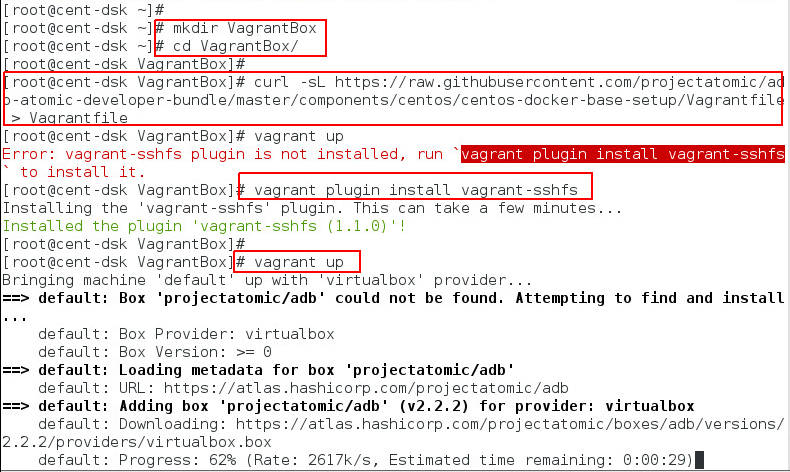 Vagrant packages are not available directly in CentOS 7 server. However, they are available through official CentOS Software Collections builds. You can install it using its ‘rpm’ package. Open the Vagrant Official Dowload page to download the latest version of the vagrant or use following Command to install the latest available vagrant package. Now we have successfully installed vagrant version on centos 7. 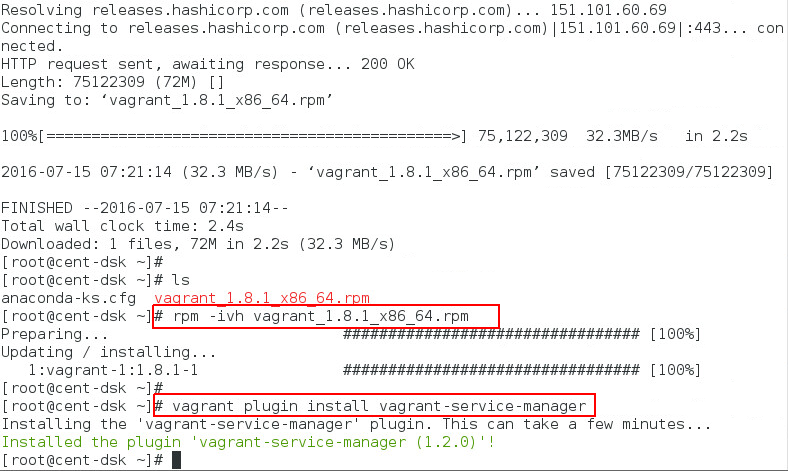 After installing the Vagrant,you can install vagrant-service-manager plugin by using below command. There are two ways to download the ADB. The one is using the Vagrantfiles Initiated Download. The ADB project provides customized Vagrantfiles, which will download the ADB and automatically set up provider specific container development environments. 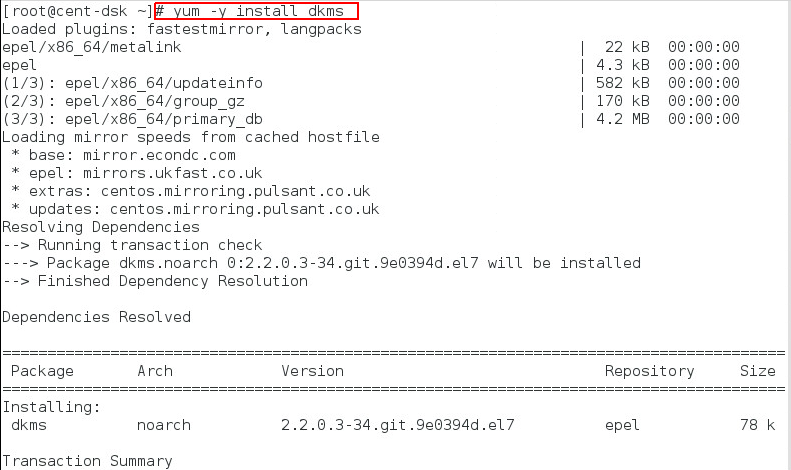 To download ADB and set up a provider specific container development environment, run the commands to create a new directory and then download the required ‘vagrantfile’ and use it with host-based tools or via vagrant ssh as shown. Use below command to get Docker Vagrantfile. For Apache Mesos Marathon Vagrantfile use command. To start the ADB use below command. This will download the ADB and set it up to work with Docker, for use with host-based tools or via vagrant ssh. You can also manually download the vagrant box from cloud.centos.org using your web browser or curl command as shown below to get the libvirt image. Once the image is downloaded, you can add it to vagrant using below command. Atomic Developer Bundle installation is complete, if you wish to destroy any data you have stored in the Vagrant box then use below command. You will not be able to restart this instance and will have to create a new one using vagrant up. 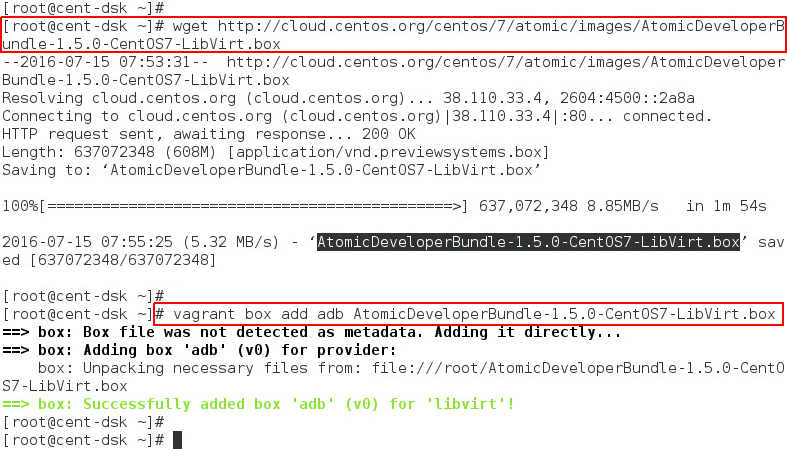 In this article we have successfully installed and setup Atomic Developer Bundle using VirtualBox and Vagrant on CentOS 7. The ADB is delivered as a Vagrant box for various providers currently libvirt and VirtualBox . The boxes are built using the CentOS powered Community Build System which differ from existing Vagrant boxes for CentOS as they have specific build requirements that are not enabled in those boxes. Let’s start using ADB on CentOS 7 and explore its awesome features.